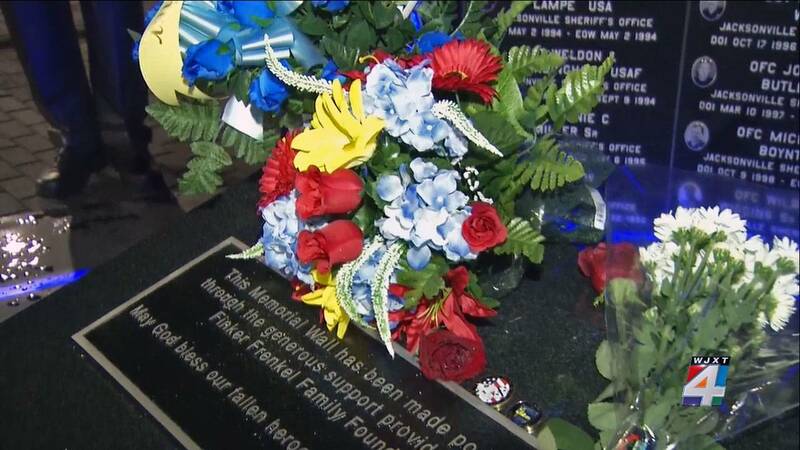 JACKSONVILLE, Fla. - Bouquets of flowers adorning the Fallen Officers Memorial downtown and messages of love on social media are among the ways people are paying tribute a Jacksonville Sheriff's officer killed in the line of duty in a Police Memorial Day crash. Officer Lance Whitaker died early Tuesday morning after authorities said his patrol car veered from the roadway and struck a tree along Interstate 295 near Alta Drive while he was traveling to the scene of a reported crash. Whitaker, a 17-year veteran of the Sheriff's Office, previously cut his teeth with the Atlantic Beach Police Department. Both agencies posted messages on Facebook, remembering Whitaker for a warm smile rivaled only by his heart. "You are gone but will not be forgotten," the Sheriff's Office said. Whitaker's death came 14 years to the day after he appeared on the reality TV series "Cops" during an episode featuring Jacksonville law enforcement. He made two arrests during filming and opened up about why he joined the force. He said it was a ride-along with a friend that stirred his interest: "What kind of got me hooked was the call I went on with him was a burglary-in-progress. There was a couple units with us. We went there. They were kicking in doors to try to apprehend suspects." "After that, all the fun, excitement, basically is why I wanted to get into law enforcement," he added. Word of the 48-year-old officer's death devastated people who know him, particularly those who served alongside him. Steve Zona, president of the Fraternal Order of Police Lodge 530, said it's the sort of news union leaders dread. "It's a call you never want to get, you go to bed every night praying that you don't get," said Zona. "Now my only job, my only concern, my only thoughts are with that officer's family and to get them through this difficult time." Whitaker's name will inevitably join those of his fallen brothers engraved on the shrine outside Veterans Memorial Arena. For now, however, flowers and messages collect at the base of the memorial as the community grieves a life taken too soon.